How the district was planning to off-set budget shortfalls. The self-described “Doomsday scenario” laid out by LA Unified’s chief financial officer at Tuesday’s school board meeting could have resulted in the loss of 2,000 teacher and administrator jobs by next spring, an increase of up to nine students per classroom, and a halt to saving for teacher retirement benefits. But then, like the cavalry coming over the hill, a letter from Sacramento arrived during the meeting and saved the district from the dire budget battle. 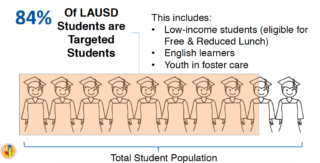 The district receives extra money for foster youth, low-income students and English learners and has to show how the money is being used for those students. Monica Ratliff and Richard Vladovic at the school board. Torlakson wrote that it appears that LA Unified could justify the $450 million and “minimize disruption to its budget.” So the state won’t require any “significant spending adjustment” until the 2017-2018 school year, after which the worst predictions of deficits are expected to start. LA Unified officials disputed the findings from the beginning and still plan to appeal the decision, but it threatened to overturn the budget planned for next year, which has to be voted on by July 1. The district came up with various scenarios for the school board members, and the board will make a final decision on June 21, but the situation seems far less severe. “I want to remind everyone we will not vote today,” said school board President Steve Zimmer. Reilly detailed “Draconian cuts” that would have had to take place in the proposed budget, including reducing the numbers of bus drivers, police officers and custodians as well as teaching staff. Even with those cuts, if the district had to change its funding for high-needs students, it would have resulted in a $500 million deficit, she said. The district is facing financial troubles based on a continuing enrollment loss and increasing costs in retirement benefits. Next year, the district expects a decline of 13,728 traditional and affiliated charter students, while independent charter enrollment will increase by about 5,984. 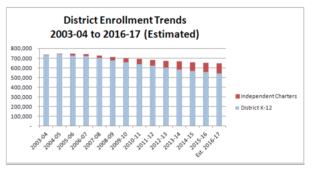 For 2017-2018 the district budget projects an additional enrollment decline of 13,087 students in the district’s traditional and affiliated charter schools and 12,169 fewer in 2018-2019, while independent charter enrollment is projected to increase by 5,492 in 2017-2018 and 3,486 in 2018-2019. Meanwhile, the district must set aside money to pay for current retiree health benefits, which Reilly estimates at $13 billion. Board member Monica Ratliff expressed concern that the district not take away from money that is set aside to go to pensions and benefits that were promised to employees. King admitted some challenges remain ahead, and pointed out that they are still pushing for adequate funding from the state for their programs. 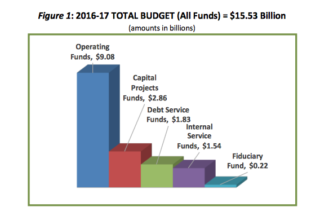 In the proposed final budget presented to the board, there’s a $183 million ending balance from this past year that will be used to balance the budget. The district still expects a balanced budget through 2018, but notes a potential deficit for 2018-2019. Reilly explained that the district doesn’t receive enough money from the state or federal governments to handle special education students, and that part of their budget realignment strategy will continue to target schools with the most needs. 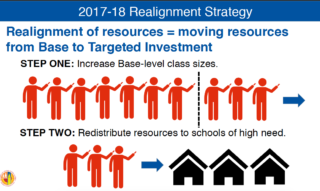 So, instead of offering the same amount per program per school, the district may have to offer more to a school that shows that its population needs more of those services. She used arts as an example. The district found that certain neighborhoods of poverty had less exposure to arts and so that gave more weight to those schools for grants. They will distribute the money to where it’s needed most. In one of the Consent Agenda items passed by the full board Tuesday, the board agreed to process “temporary borrowings” recommended by Reilly. “Temporary borrowings are made in situations where the district advances cash from a fund with sufficient cash balance to pay obligations from a fund with insufficient cash balance,” Reilly said. The money is paid back within the legal time period, she added. Most of the temporary borrowing, a total of nearly $175 million, was used for the Cafeteria fund, and all was replaced; $82 million was borrowed from the County School Facilities fund for Measure Q and all was repaid, and $36.8 million was borrowed from the general fund for the children’s services fund and all but $9 million was repaid to date, she said. Among the nearly three dozen people speaking about the budget Tuesday were a few students who asked that more money be spent on classes rather than police. “I would rather the $60 million for school police be reduced and spent on restorative justice programs,” said Laura Gutierrez from Roosevelt High School. 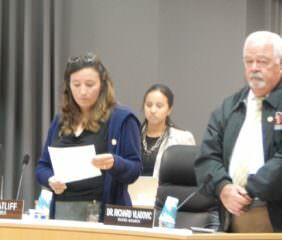 The school board is set to meet next Tuesday afternoon to hear the final budget, and a new assessment after the Torlakson letter, and make a final vote on the budget.